We invite you to participate in West Hills College Coalinga’s Farm of the Future Spring 2019 FFA Field Day. The March 2rd event will include competition in the agricultural mechanics, agricultural welding, farm power and land judging events. 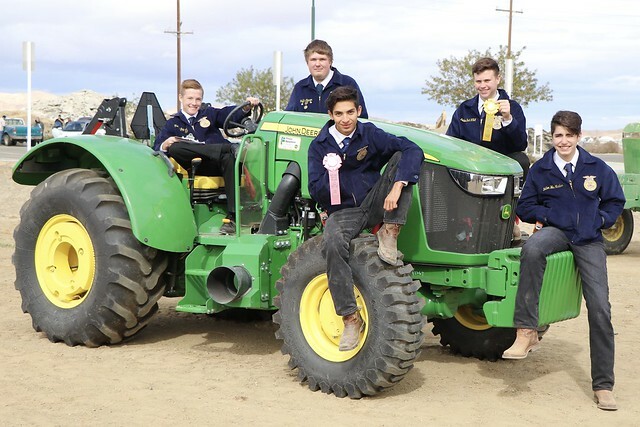 Each year the West Hills College Coalinga's Farm of the Future hosts an FFA Field Day where FFA teams throughout the Central Valley compete in specific career development events. Students who participate in our FFA Field Day will also receive a tour of our state of the art Farm of the Future and an overview of agriculture programs offered by West Hills College Coalinga. The Field Day action will culminate with an awards ceremony for winning teams and individuals. Buckles will be awarded to first place individuals and ribbons to 1st through 5th place teams. A sweep-stakes trophy will also be awarded. Please advise students that FFA uniforms are expected. Buckles for 1st place individuals, Ribbons for 1st-5th individuals and teams, and sweep­stakes trophy. 6:30 AM Onsite Sign-in Begins – Advisors check in at picnic tables in front of Farm Offices. Please be sure to complete team forms and review rules and procedures for each competition. 7:30 AM Departure for Land Judging Competition (Advisors to provide transportation), approximately 1 hour of travel to contest site, contest begins at 8:30 and should return to campus by 12:00. 8:00 AM Ag Welding ($25 fee per contestant), Best Informed Greenhand and Farm Power competitions begin. For more information about the contest, contact Tim Ellsworth at (559) 997-5339 or timothyellsworth@whccd.edu.